Today’s post links to my previous post concerning the importance of inflexible knowledge and why it is the foundation of expertise. As a result, it was argued that we should spend a significant amount of time teaching our students topics until the point of mastery. What I mean by mastery is that students should be able to access key pieces of knowledge from memory, specifically their long term memory, instead of students attempting to complete different calculations in their working memory to solve a problem. For example, students should be able to automatically tell me that the square root of 9 is three, rather than calculating the square root of 9 in their working memory. We need to ensure that our teaching and learning of the GCSE is seen as a 5 year plan, where in KS3 we teach different concepts to the point of mastery – to the point of memory retrieval. Inflexible knowledge is the starting point. Can students instantly recall basic times table calculations? 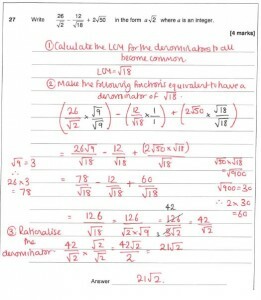 7) Simplifying fractions where we divide 126 by 3 to obtain a numerator of 42 and a denominator of √2. Evidently, there is a lot of thinking required to answer this question. There are many logical steps that need to be taken to progress from the problem to the solution. In this case, the difference between students who are experts and those who are novices is that the experts will be able to tell me that the LCM of √2, 18 and 1 is √18. As a result, we must multiply each fraction (numerator and denominator) by a common factor to achieve each fraction in the question to have a like denominator of √18. The only thinking in working memory should be the logical steps to take from the problem to the solution. Not the calculations to each step – that should be an act of memory retrieval. How can this be achieved? 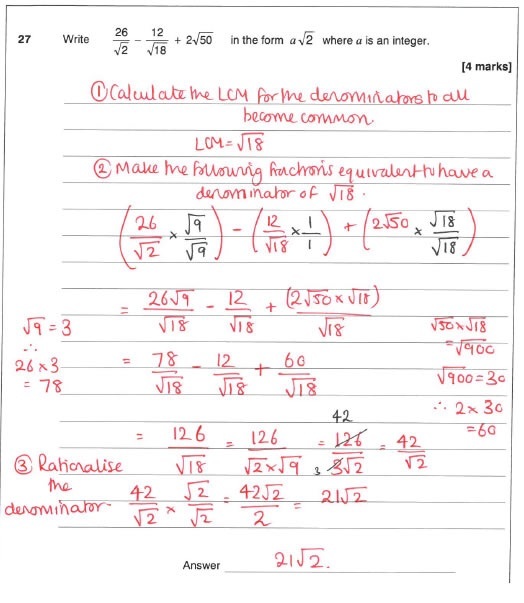 Only through extensive and distributive practice of finding the LCM of multiple numbers, finding equivalent fractions when adding and subtracting fractions with unlike denominators. This is the first step in the solution, which needs to be recognisable to all students. Automatising procedural knowledge of adding and subtracting fractions is necessary. It is one example of why inflexible knowledge is the bedrock of academic success. Similarly, only by identifying that √9 is equal to 3 can we then change the numerator of the first fraction. Again, inflexible knowledge such as square roots and square numbers represents another step towards the solution. As teachers, we need to analyse exam papers and problem types, and look at our schemes of work as a five-year plan. How can we structure our teaching and learning to ensure that our students have the necessary background and procedural knowledge to attempt such problems? That these problem types will never be repeated? We cannot get students to memorise a model exam answer. This is not possible and neither is it recommended. We desire our students to see the connection between different concepts, however this is only achieved if students automatise different pieces of inflexible knowledge in the early years of KS3 and only then introduce problem types which connect different concepts. My next post will outline the practical techniques I have been trialling within my lesson planning for my Y7 class. Watch this space. Why is inflexible knowledge important?